A while back, I wrote a post about solo female travel. Who knew I would be contemplating and putting into action doing just that for an extended period of time. I belong to several RV travel Facebook groups and every time I see someone ask how solo female travelers keep themselves safe, many respond with “don’t be afraid.” I don’t think wanting suggestions for how to keep yourself safe has anything to do with fear, at least not for me. For me, it’s no different than asking what their favorite must haves are. It is about being confident that you can avoid a dangerous situation. It is about being prepared and making your travels as fun and rewarding as possible. Although these solo female travel safety tips are geared towards solo female RV travelers, many make sense for any solo female, even at home. Traveling in a class A, B or C motorhome has the advantage of being able to jump in the driver’s seat and leave a location if you feel in danger. 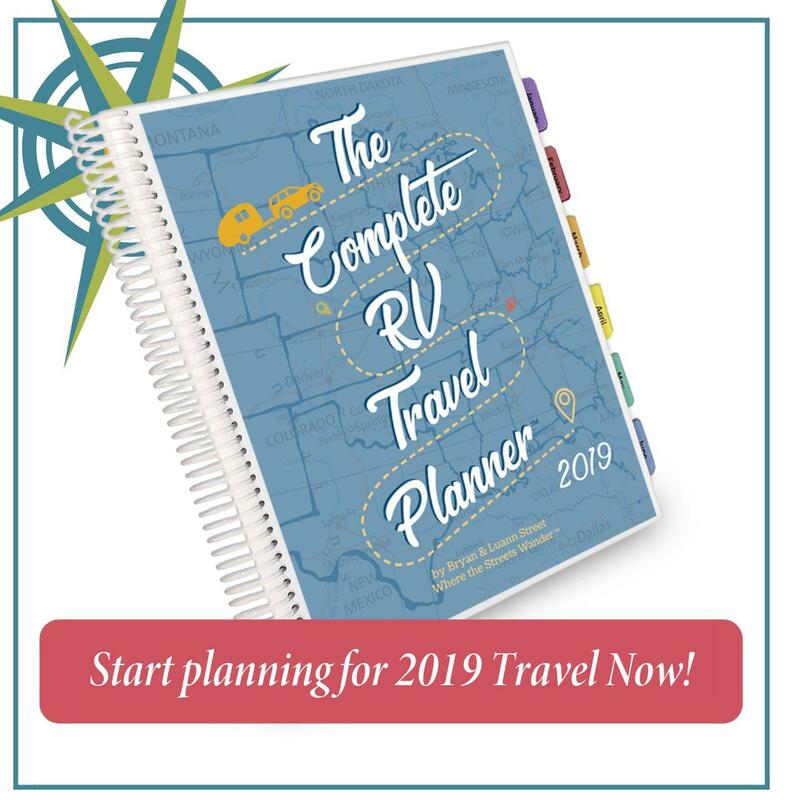 Other forms of RV travel, like my travel trailer, which are even often disconnected from the tow vehicle, are at a bit of a disadvantage there. There are still several things you can do to stay safe and feel at ease while traveling alone. Here are some of my favorite solo female travel safety tips and ones I will likely use. I think this is by far the most important theme I hear over and over regarding solo female travel safety. If you pull into a spot and it doesn’t feel right, leave. Be aware of your surroundings at all times. This is something that should not be a new concept to you. You should be thinking about this even walking down the street in your own neighborhood. Never give the impression you are alone. Leave at least two chairs out. Some suggest leaving a large pair of men’s boots outside at night. I snickered at this at first but it does make sense. I have never used the emergency alarm on my car except once by accident when I first got my car. I hit the panic button by mistake but didn’t realize it and didn’t know how to turn off the alarm. It was a bit disconcerting since I had never had a car with this feature before. I’ve still never used it, 13 years later, so I don’t know if I would ever have thought to use it if I hadn’t read the suggestion in a Facebook group. Even before reading the suggestion, I had thought of getting an air horn since this is something we always had on our boat for emergencies. This is a great alternative if your car doesn’t have an alarm and a good back up even if it does. While looking at air horns, I also came across these personal security alarms that can go on your keychain. So, so many people suggest getting a dog. I love dogs, but don’t have one and don’t want one. I will be traveling with three cats and they are pretty quiet. What I will consider doing is getting one of those recordings of dogs barking. Again, I thought it sounded a little silly but I know they can be effective as a deterrent. Using the above suggestions to deter an assailant is by far the preferred solution. But what if you need more? What if you actually have an intruder? I’ve seen all kinds of suggestions for things to use as a weapon, with a baseball bat being the most common. Just keep in mind that it is illegal, at least in California, to have a baseball bat solely for the purpose of self-defense. Yes, you can keep a loaded shotgun under your bed but not a baseball bat. You’d better have a glove and some balls around too. More nonsense from California. I’m not exactly a weakling, but I don’t know if I have enough upper body strength to do any good with a bat anyway. So, how about a gun? Well, I love guns and shooting target practice (I’m pretty darn good, by the way) but you have the issue of where they are legal and where not. I think I would be more comfortable using something like a taser, stun gun or pepper spray, which are legal almost everywhere. Yes, those are legal in California but not that baseball bat. Be sure you know the laws where you are. I’ve seen some people suggest bear spray and some recommend pepper spray, so I had to research the difference. I found an article that was so helpful. In a nutshell, bear spray is intended to only deter a bear. It has a lower concentration of the active ingredient and creates a fog. Pepper spray is intended to inflict pain and incapacitate. It sprays a stream for a shorter distance. I’m still not sure which I will get since each is a little different, but one or the other, if not both (bear spray for hiking and pepper spray for self-defense in and around the trailer), will be onboard before I leave in September. So there you have some of the best ideas I have found for solo female travel safety so far. Have I missed your favorite? Do you feel safe when you travel alone? Please tell me your thoughts in the comments. RV lifestyle, safety tips, solo female. Bookmark. Most importantly, be aware of your surroundings before you get out of your vehicle. I passed up a rest stop just yesterday because of the feel. Happy travels from the road! Awesome suggestions, Cathy. I am definitely considering getting a CCW. I had one in Nevada but never got one when I moved back to California. Maybe our paths will cross some day on the trail! Those are good suggestions. Bein’ from the South, of course we like guns fur safety. But, as you know mommy uses a cane. They are legal everywhere, as are walkin’ sticks. And, they’re great self defense items as well. You can also buy them with hidden compawrmtents, with knives, swords, flashlights, pepper spray and other stuffs. Again, legal everywhere and you don’t look strange walkin’ with them, so nopawdy would question why you’re carryin’ ’em. Keys t’ween your fngers can be jabbed into an eye, the neck, face, etc. and act like a knife, so always keep your keys in your hands when walkin’, stead of throwin’ ’em in your purrse or pawcket. They’re close combat, but still good. So are teeth, never be ‘fraid to bite an attacker ifin needed. But mostly, don’t furget to have fun. Stay in decent areas and take note of your surroundings. Good luck. What great ideas. Thanks for all the input. I hadn’t thought of my hiking/walking sticks that I’ll have with me. Can’t wait to get on the road. I heard from a police officer to use wasp spray instead of bear spray, and in addition to pepper spray. Wasp spray allows you to shoot from a much farther distance, with pepper spray you have to be up close. Pepper spray apparently functions better though. Either way, he said to aim for the eyes, the groin, and the hands. In that order. The attacker will have to try to get it out of their eyes/groin, but if you spray it on their hands then the process will continue, giving you plenty of time to get away.